Cars, Coaches and Minibuses are available to suit all occasions whether the transport is for corporate events, weddings or airport transfers. Our executive cars are mostly Mercedes including E class’s and in immaculate condition but other cars are available should you require them. All available Luxury Coaches and Minibuses are top of the range and some features include tables, fridges, drinks/catering facilities, reclining seats, air conditioning and tinted windows. The features available will differ between available vehicles, so please clarify your requirements with our customer service team when obtaining a quotation. Executive Coaches and Minibuses will have air conditioning and on board toilets (depending on this size of the vehicle). These vehicles are mid range specification which results in a comfortable and cost effective solution for travel. Standard coaches are unlikely to have on board toilets, aircon or on board entertainment and therefore, it is recommended that these vehicles are used for short distance journeys. It is highly likely that these coaches will have been used for school trips and your expectations should be of nothing more than a very standard, road legal and properly insured vehicle. Bouden Coach Travel would not recommend this kind of vehicle for weddings or corporate events but they’re perfectly suitable for school trips and transporting teams between local matches. 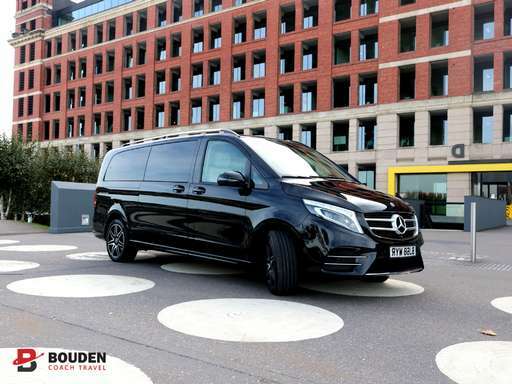 When your looking for UK Airport transfers, Bouden Travel can accommodate groups of all sizes. Flight tracking for return journeys come as standard so you can rest assured that even if you are delayed, we will still be there to collect you and take you home safely. Meet and Greet is also available, ask our friendly customer service team to arrange this for you. When arranging travel for school trips it is even more important to know that the passengers safety is in the right hands. All of our drivers undergo regular CRB checks and all relevant insurance and vehicle checks are maintained and completely up-to-date. Bouden Coach Travel are the approved school travel provider for many local councils. For further information please do not hesitate to call the customer service team and they will be happy to answer any questions quickly and transparently. If your looking for wedding transport, we can provide you with unbranded white vehicles perfect for your special day. Bouden Coach Travel have vehicles to suit all occasions so whether its a business away day, stag or hen do, birthday bash, wedding or airport transfer, we have you covered.